I tried to come up with a challenging bicycle trip for this summer. My first thought was to cycle the width of Utah, but having done the length of Utah last year, that seemed not such a big deal. Instead, I opted to go for spectacular scenery. 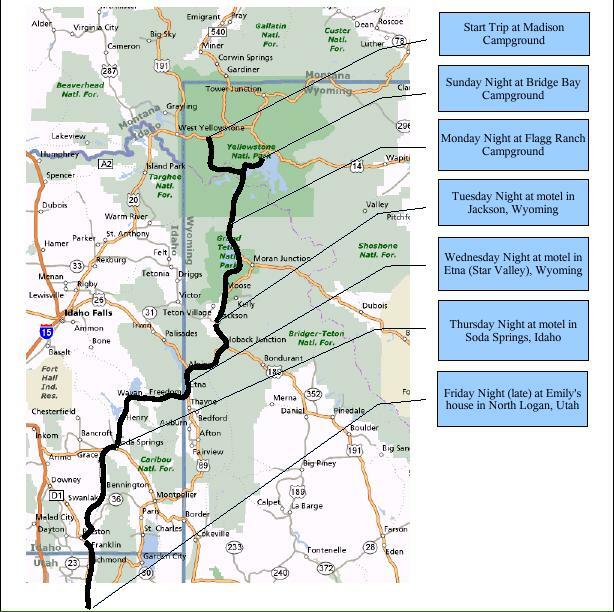 The route I chose was from West Yellowstone to Logan. We opted to start at Yellowstone because the elevation there is about 7000 feet, and the elevation of Logan is 4,585 feet - a net downhill trip rather than uphill. Logan was chosen as the end-point because my daughter Emily would be giving us a ride up there, and Logan is where she lives. We chose the route to avoid big climbs wherever possible (in particular, avoiding the climb over the mountains west of Bear Lake). It turned out to be a very beautiful route, and was green all the way - even in mid June. The scenery was fantastic, and seen from a bicycle, it was even better. Yet there was a lot more hill climbing than I thought (lacking topographic map information for Idaho & Wyoming). And we had some unexpected challenges from the weather, being snowed-on two of the times we crossed the continental divide. Here is a map of the route we chose. Note that in Yellowstone we doubled-back along the shores of Yellowstone Lake. The text-boxes on the right point to the locations where we stayed overnight. Madison C.G. to Bridge Bay C.G. Bridge Bay C.G. to Flagg Ranch C.G.